I think I might actually have found a snack that I can enjoy without the guilt and that might actually be good for me. I stopped in Whole Foods the other day before my hair appointment to grab a cup of coffee and some trail mix to take with me to my appointment(highlights can take a while and I had not eaten breakfast). I was walking down the cracker and nuts aisle and came across a small bag of roasted broad beans by Enlightened. I had eaten roasted broad beans before but not this brand. I turned the label over(because I always read the label) to look at the ingredients and nutrional information. 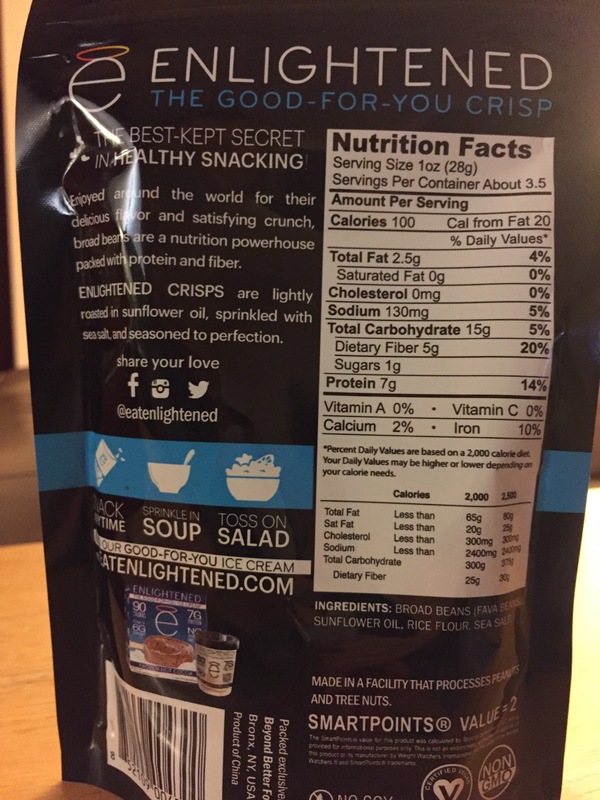 I was surprised to see that this snack food packs a whopping 10% iron, which I seem to run low on at times, 5 grams fiber, 7 grams protein,only 2.5 grams of fat, and 0 Saturated fat. A serving is around an ounce and only 100 calories. I picked up a bag and got my soy/almond milk mocha and headed over to the salon. On my way there, I opened up the bag of beans and popped a couple in my mouth. I was pleasantly surprised at how delicious they were. They were crunchy, a little salty and slightly sweet. They went well with my mocha. When I got to the salon I offered a few to my stylist. She too hadn’t eaten yet and was also impressed with the flavor. When she was done with my hair, I headed back across the street to Whole Foods to pick up another bag to carry me through the week. I buy 2 bags per week. This has become my new go to snack when I crave snack food. I am sharing this in my blog mainly for shelffish reasons, I want this company to succeed so I won’t ever run out of this snack! I already have plans to take a couple of bags with me in December when we go to Disney. Since I’m vegan, I’m always looking for healthy, portable, sustaining food items and this certainly fits the bill!